Its that time of year again. Time to pay your yearly SCV Dues. Dues help your Camp, Division and National Organization pay for recruiting supplies, legal fees, conventions, printing, projects, etc. Without Dues, we would not be able to exist. You will need to contact your Camp Adjutant about your local Camp Dues. SCV National Dues $30 (add $5 if you are delinquent or are a new recruit). 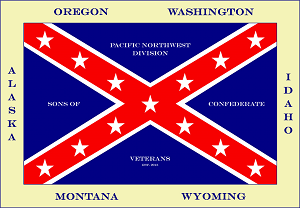 The Sons of Confederate Veterans headquarters is currently working on a online Dues paying website, where we will be able to pay Camp, Division and National all at the same time. This will make collection Dues much less confusing. I am certain that we have lost members because of the archaic way we have to collect Dues. On May 21st, the Cpl. William Mink Camp 2244 of Boise, Idaho, participated in Nampa, Idaho’s “Parade America” Parade. They were greeting with overwhelming support from the public and even picked up a new member because of it. I’m calling on each Camp in our Division to find a local Parade that their Camp can participate in. There are way more supporters of the Cause than what is being said to us by the Media. SCV Camp 2244 has been very active in the short 2 years they have existed as a Camp. Keep up the great work brothers! The Washington National Cathedral says it will remove two images of the Confederate battle flag from the building’s stained glass windows, classifying them a symbol of hatred and racial supremacy. The windows also honor Confederate generals Stonewall Jackson and Robert E. Lee. A five-person task force that examined the windows’ symbolic power said the flags cannot remain on the cathedral’s stained glass. The task force cited recent events to justify their decision in their report. A former South Carolina police officer has filed a federal lawsuit against his former employer, claiming he was unjustifiably fired over a photo of himself posing in Confederate flag underwear during last summer’s swirling debate over the flag and other Confederate symbols. In his filing, former Sgt. Shannon Dildine wrote that he was aware of the debate, which exploded after a white man charged with shooting nine black people to death at a Charleston church was shown in online photos embracing Confederate symbols and talked about starting a race war. But Dildine, then an officer with police in North Charleston — about 6 miles north of Emanuel AME Church in downtown Charleston — said he was on vacation when the shootings happened and wasn’t aware that alleged shooter, Dylann Roof, had been seen in photos glorifying the flag. The department contacted Dildine about the photo, which he said he deleted from social media immediately. He was fired days later, told he was being terminated because of the photo. In his lawsuit against the city, Dildine says that he is not a racist and views the flag as part of his southern heritage. He said a black officer who posted a photo of himself alongside someone wearing a “Black Lives Matter” shirt was not fired or disciplined afterward. City and police officials didn’t immediately return emails seeking comment Friday afternoon. They have not yet responded to the lawsuit in court filings of their own. ( The following article was sent to me by out ATM Commander Lauret. It seems even good people are against us these days. It truly is sad to see so much ignorance and disrespect for our heritage and history. The Confederate Soldier demonstrated what a true Patriot really is. He deserves the highest honors for his bravery, convictions and love for his family, and home State. The Southern Baptist Convention, once founded as a pro-slavery denomination that aligned itself with the Confederacy, voted Tuesday to condemn the Civil War battle flag of the South. The resolution was proposed by William Dwight McKissic Sr., a black pastor in Arlington, Tex., who told The Washington Post before the vote Tuesday that he thought it imperative that the Southern Baptist Convention — the United States’ second-largest religious group, after only Catholicism — make a statement about the flag after the slayings in a church in Charleston, S.C., a year ago. “You can’t take something that is contaminated and make it innocent. I think to honor those nine people in Charleston that were killed, surely you can repudiate what drove Dylann Roof to kill those folks. You say to the black community, we identify with your pain. We share your pain,” McKissic said. Before the Southern Baptist Convention gathered for its annual meeting Tuesday, McKissic and the denomination’s president, Ronnie Floyd, said they were not sure whether the resolution would make it out of committee, let alone pass a vote. Commenters on McKissic’s website responded with defenses of Southern heritage when he announced he submitted the resolution. Instead, when the resolution came up for a vote, attendees at the meeting amended the words to make it stronger. Moore said that voters took out a reference to the sense of family history that leads some people to fly the Confederate flag. And where the resolution committee proposed a draft asking that Southern Baptists “limit” use of the flag and “consider” outright removal, the whole group amended that. The denomination’s resolutions are not binding upon churches, but church insiders said nearly every Southern Baptist church abides by them.